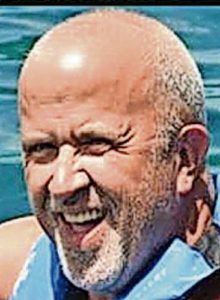 Larry Minto, 58, of Staten Island, N.Y., passed away on Wednesday, Sept. 14, 2016, at his home. He was a loving husband and father who served in the United States Navy for 10 years. He was born in Mariners Harbor, Staten Island, and attended Port Richmond High School. After serving his country, he was and had been employed in the 32BJ Union in Manhattan. Larry enjoyed spending time with family and friends. He is survived by his beloved wife, Mary Minto; his children, David Alavarces and Theresa Kobrin, and three grandchildren. He is also survived by his siblings, Roberta Budalich, Norman Jay Minto, William Minto, Ginny Ferraris, Mark Minto, and many nieces and nephews. He was predeceased by his wife, Helen Minto; parents, Robert and Audrey Minto; stepmother, Jane Minto; brother, Donald Minto, and niece, Kathryn Ferraris -Taylor. There will be a memorial from 1 to 4 p.m. on Saturday, Sept. 24, at Cherubini McInerney Funeral Home. The family asks, in lieu of flowers, memorial contributions may be made to the Katie Ferraris-Taylor Oncology Nursing Fund at Winship Cancer Institute of Emory University, 1762 Clifton Rd. NE, Suite 1400, Atlanta Ga. 30322, in memory of Larry Minto.